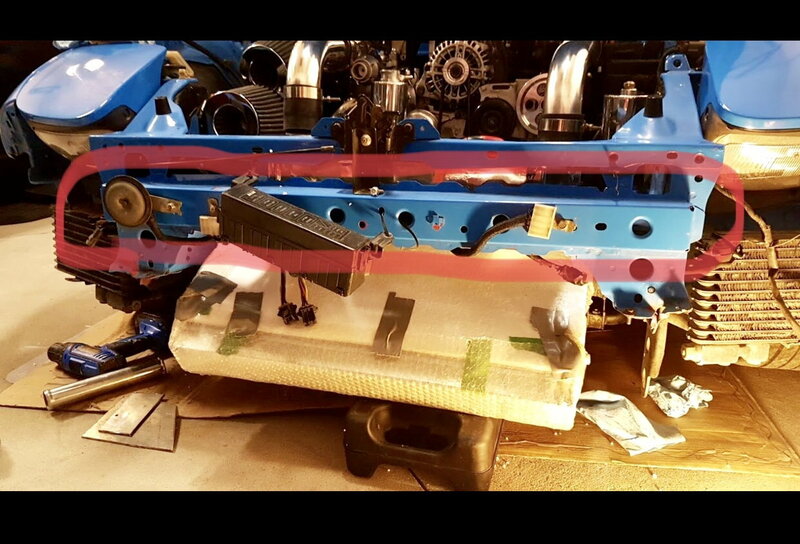 does anyone have a pic of their FD front end disassembled that they can post to help me identify a part and part number? One without front bumper/bumper support with stock intercooler set up, thanks! 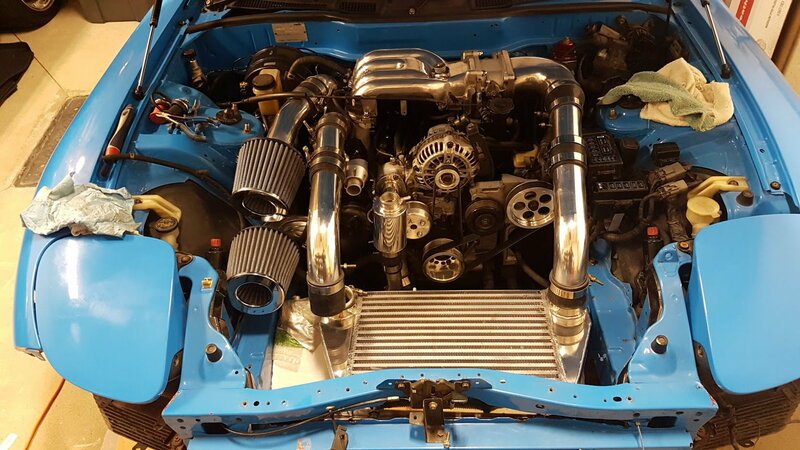 You may want to do a Google image search on RX-7 intercooler install, should be lots of pics out there. Or you may want to let us know just what you are trying to find out, we may be able to help. She's a little far from stock, but here you go. i tried google but I did not type intercooler install, I will try that as well thank you! 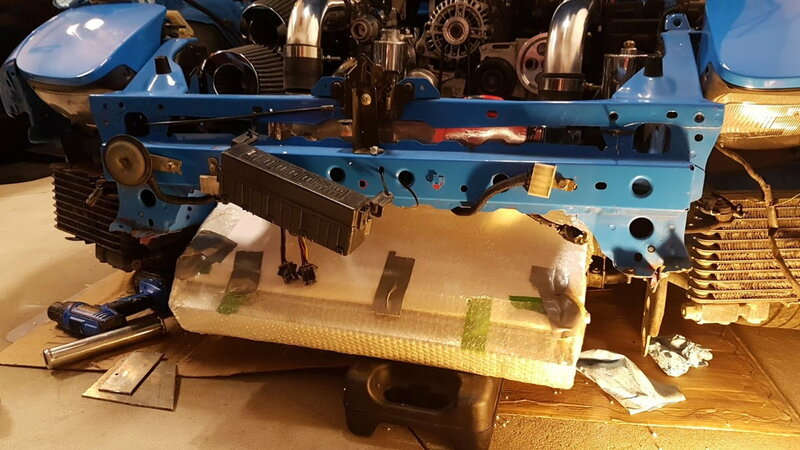 Some intercooler setups require that front bar to be removed. I'm sure that's why it's gone. That piece is structural so you definitely want to have something substantial there. It could have been damaged in an accident, that's quite possible. That piece is spot welded on. It would be nice to have the proper piece on there and properly welded on, there are some things that bolt up to it (horns, some wiring). A large piece of metal welded on would probably work just as well, it is something of a cosmetic issue. The other big thing is the hood latch attaches to that bracket. Without it the latch will flop around, making the hood hard to close and stressing the top (flimsy) part the latch is bolted to. Last edited by DaleClark; 02-04-19 at 01:11 PM. definitely not a strong piece of metal, pretty sure it’s broke actually. And that did happen to my hood latch, I got done working on it and the hood wouldn’t close so I had to bend it a little upward. So it sounds like it would def be worth my while, thank you for the insight! Pic's of my Burnout front end with new paint job...(56K Beware!). Pic request: 99 Front end with Feed side skirts. Pic requests of FD with GTC and Cwest Front end in Black??? Quick Reply: Front end pic?